70 years ago on this date, April 13, 1945, the 12th SS Panzer Division Hitlerjugend fell from Vienna, Austria. I will post information about Adolf Hitler’s child soldiers, the 12th SS Panzer Division Hitlerjugend from Wikipedia and other links. 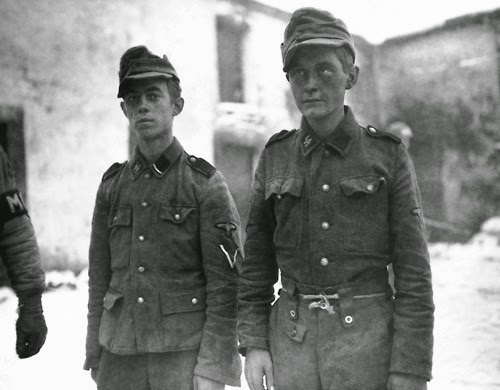 Captured soldiers from the 12th SS Panzer Division "Hitlerjugend". Unit insignia of 12. SS-Panzer-Division Hitlerjugend. The symbol was the result of a competition. The 12th SS Panzer Division Hitlerjugend ("Hitler Youth") was a German Waffen-SS armoured division during World War II. 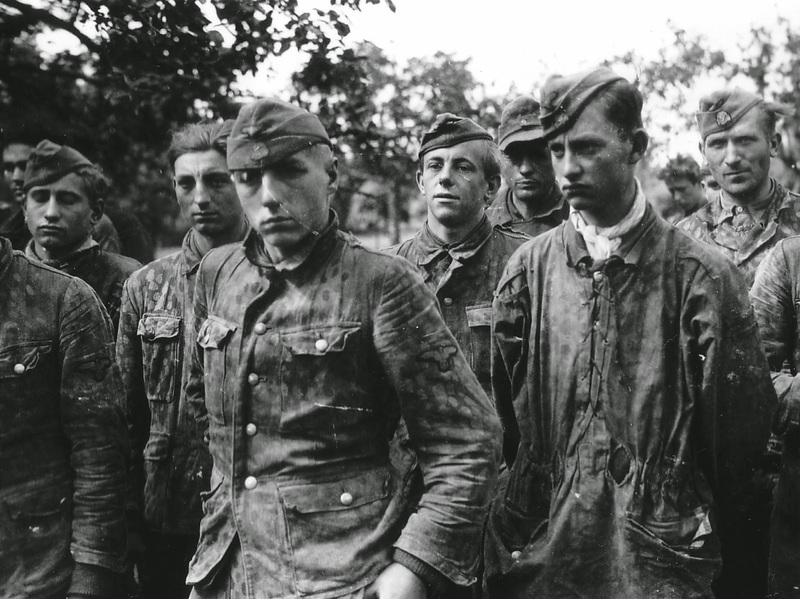 The Hitlerjugend was unique because the majority of its junior enlisted men were drawn from members of the Hitler Youth, while the senior NCOs and officers were generally veterans of the Eastern Front. The idea of a Waffen-SS division composed of Hitlerjugend (HJ) members was first proposed by SS-Gruppenführer Gottlob Berger in January 1943. Berger approached Reichsführer-SS Heinrich Himmler with the proposition, and Himmler soon became an enthusiastic advocate. The plan for a combat division made up of all Hitlerjugend members born in 1926 was passed on to Adolf Hitler for his approval. Hitler was also enthusiastic about the idea, and on 13 February 1943, the official order for the creation of an Hitlerjugend division was issued. Berger nominated himself as the divisional commander, but Himmler instead chose 1st SS Panzer Division Leibstandarte SS Adolf Hitler (LSSAH) veteran, SS-Oberführer Fritz Witt. A competition was held to design insignia for the new unit. 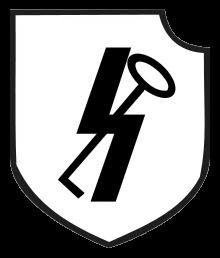 The winning design, picked from thousands of entries, depicted the Hitlerjugend sigrune crossing a key from the 1st SS Panzer Division LSSAH's insignia. 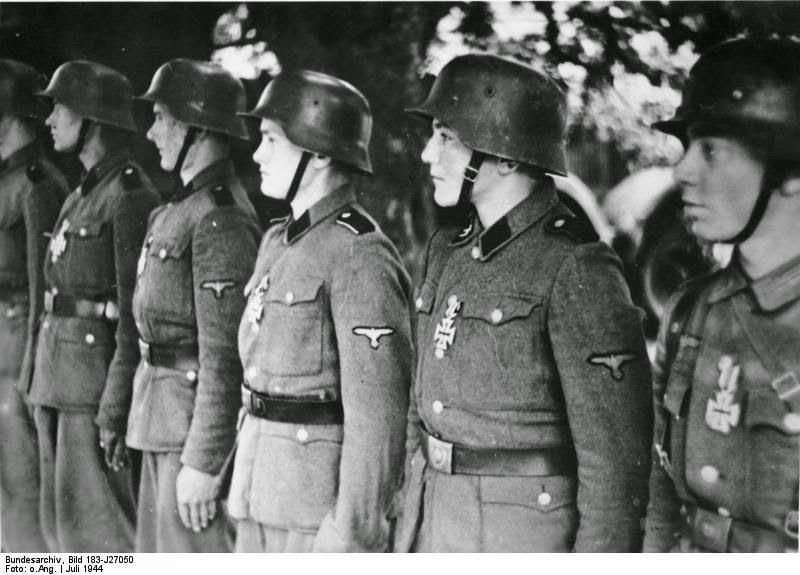 By 1 September 1943, over 16,000 recruits had completed their six-week basic training and were listed on the rosters of the SS Panzergrenadier Division Hitlerjugend. As training continued in Beverloo Camp, Belgium, the division was notified that it was to be formed as a panzer rather than a panzergrenadier unit, and the division was redesignated SS Panzer Division Hitlerjugend. Many of the recruits were so young that they were supplied with sweets instead of the standard tobacco and alcohol ration. In late October 1943 the division received its final designation, 12th SS Panzer Division Hitlerjugend. While the Hitlerjugend members, who had grown up under NSDAP propaganda, were committed to the Nazi cause, they had no military experience. To provide a skilled backbone for the division, veterans from the 1st SS Panzer Division LSSAH were assigned to the Hitlerjugend division and provided all the regimental, battalion and most of the company commanders. However, the SS could not provide all the officers required and 50 army officers were assigned. They served in their army uniforms but were completely part of the division. Training for the division was unusual. 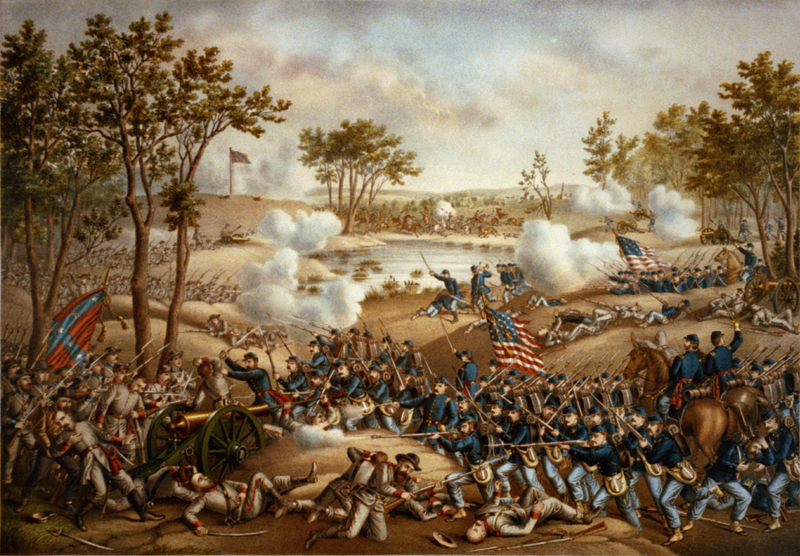 Witt, realizing that his division had to be made ready for combat as quickly as possible, ignored many rules and regulations and instead focused on realistic combat scenarios and live-fire exercises. A result of this was that the morale of the 12th SS was exceptionally high, and the relationship between the officers, NCOs and men was an informal one, based on mutual trust and respect. In March 1944 the 12th SS was deemed ready for active service and was ordered to move to Caen in Normandy and became part of the I SS Panzer Corps. Throughout the spring of 1944 the division continued training exercises in the peaceful area around Caen, familiarizing itself with the terrain. This proved invaluable in the months that followed. On 27 May, Witt celebrated his 36th birthday and his recent promotion to SS-Brigadeführer. The peaceful 'holiday atmosphere', as one grenadier described it, was soon shattered. At the beginning of June 1944 the division was declared ready for combat operations. 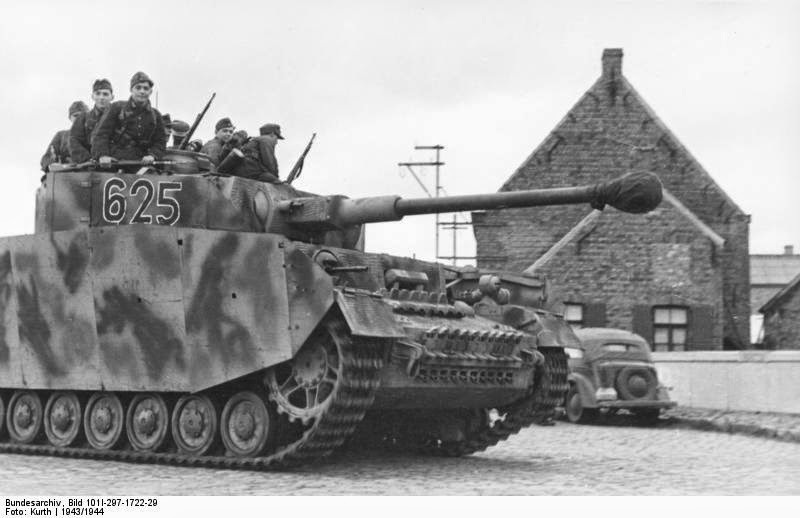 The Division's tank strength at this time was about 66 Panther and 90+ Panzer IV tanks. 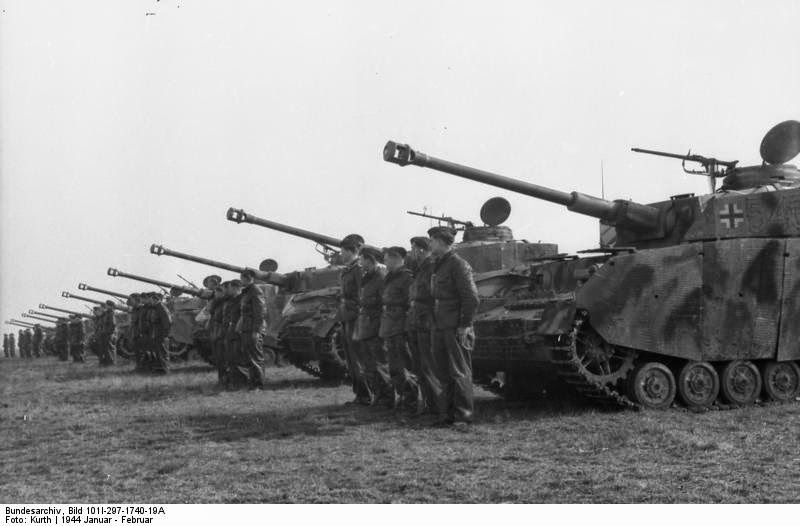 The division was also equipped with Jagdpanzer IV tank destroyers, three prototype Wirbelwind flakpanzer vehicles, along with a number of 20 mm, 37 mm and 88 mm flak guns, Hummel, Wespe and sIG 33 self-propelled guns and regular towed artillery pieces. Its tank destroyer unit, the 12th SS Panzerjäger Battalion, however, was not considered ready for action and was understrength in Jagdpanzer IVs. On 6 June 1944, the Western Allies launched Operation Overlord, the invasion of France. The 12th SS Panzer Division, along with the 21st Panzer Division, were the closest Panzer divisions to the landing beaches, but they were unable to move until they got authorization from Hitler. The 12th SS was not ordered to the front until 1430 hours on 6 June, over twelve hours after the first reports of the landings. Prior to this Field Marshal Gerd von Rundstedt had ordered over half of the division to deal with a parachute landing on the coast near Lisieux which were found to be dummies from Operation Titanic. Kurt Meyer's 25th SS Panzergrenadier Regiment and Max Wünsche's 12th SS Panzer Regiment were the lead elements of the Division as it started for Normandy from their base to the west of Paris and South of Rouen. The Division's advance to Normandy and the British/Canadian landing beaches of Sword and Juno was severely hampered by the incessant allied fighter-bomber attacks. The losses to Allied aircraft were not heavy, but the delays caused by wrecked vehicles were enough to destroy the Division's timetable. The first units of the 12th SS finally reached their assembly area near Evrecy at 2200 hours on 6 June. 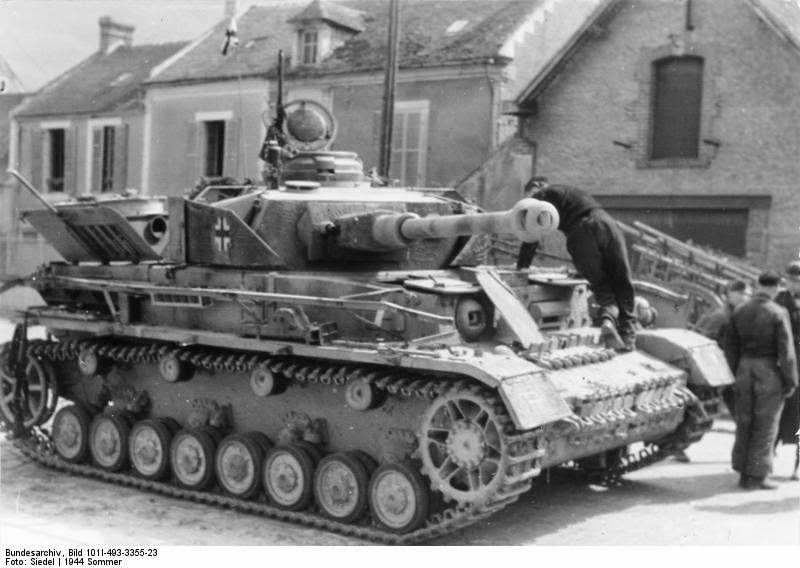 At 1000 hours on 7 June, Kurt Meyer's 25th SS Panzergrenadier Regiment, along with 50 Panzer IV tanks of the 2nd Battalion of Max Wünsche's 12th SS Panzer Regiment, arrived and moved into position north west of Caen. Supported by a battalion of artillery (3rd Battalion, 12th SS Panzer Regiment), this battle group was ordered to crush the advancing Canadian infantry and tanks and drive through to the coast, a few kilometres away. In Meyer's words they were to "throw the fish into the sea". Meyer had three Panzergrenadier battalions and two companies of tanks on each flank with artillery in support. While planning to start his attack at 1600 hours, Meyer's hand was forced at about 1400 hours by a battlegroup of the North Nova Scotia Highlanders and tanks of the 27th Tank Regiment (Sherbrooke Fusiliers) who were advancing to Carpiquet. Watching the Canadian advance unfold from the tower of the Ardenne Abbey, he saw an opportunity opening in front of him. The Canadians continued to file across the German front. Once the lead Canadian tanks reached the ridge south of Franqueville, they spotted one of the panzer companies waiting in ambush (they had allowed the tanks to move forward without firing a shot). Meyer reported that "The battalion maintained excellent fire discipline" and the advancing tanks moving across the front were then hit in their unprotected flank by the tanks of the 12th SS Panzer Regiment. The attack by the 12th SS had caught the Canadians by surprise, and their infantry were forced to fall back to Authie with Meyer's 3rd Battalion in pursuit. They captured Authie and Franqueville in their initial attack and the next objective was Buron, a kilometer to the north. Although the attacks destroyed many Canadian tanks and overran a company of the North Nova Scotia Highlanders in Authie, they failed to break through the Canadians around Buron. Meyer, however, countermanded the divisional commander's order on his own initiative, feeling that objective unrealistic, and hoped to merely stop the flow of Canadian units inland until the situation could be stabilized. The attack by the 12th SS Panzer Division Hitlerjugend was supposed to have been supported by the 21st Panzer Division but they could not disengage from fighting the British 3rd Infantry Division and were still at Couvre, as a result the right flank was open and being probed by Canadian tanks, which were destroyed by the anti-tank platoon of the 1st Battalion. During these attacks the 12th SS had captured about 150 prisoners from the North Nova Scotia Highlanders and crews from the 27th Tank Regiment (Sherbrooke Fusiliers). According to Lieutenant Colonel Mel Gordon the 27th Tank Regiment had lost 28 Sherman tanks and the North Nova Scotia Highlanders 245 men on 7 June. 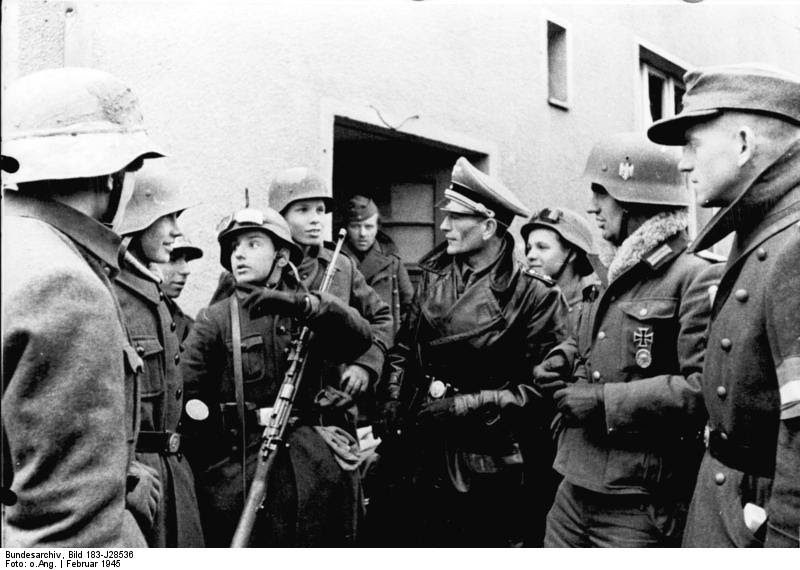 Casualties of the 25th SS Panzergrenadier Regiment amounted to about 300 men. 15 Tanks from the 12th SS Panzer Regiment were also destroyed. Late on 7 June, the 26th SS Panzergrenadier Regiment under command of SS-Obersturmbannfuhrer Wilhelm Mohnke arrived on the battlefield. Meyer's attack had pushed back one part of the Canadian advance but to the west of Meyer, the 7th Canadian Infantry Brigade had occupied a group of small villages three kilometres into the German line. The 26th Panzergrenadier Regiment crossed behind Meyer's regiment and took up positions to their west. After planning and positioning the regiment for a powerful thrust the 1st Battalion launched an attack towards Norrey-en-Bessin, defended by the Regina Rifles of the 7th Canadian Infantry Brigade, 3rd Canadian Division. Their orders were to overrun the Canadians and force a deep wedge between them and the British division to the west. No reconnaissance of the Canadian positions was done and the infantry met a maelstrom of defensive fire from firmly established positions. No use was made of the fact that the Reginas' flanks were exposed; instead, 'the enemy flung himself straight against the strongest points and utterly failed to exploit the undoubted weakness of his opponent's position. On the Canadian right the 2nd Battalion attacked the Royal Winnipeg Rifles defending the village of Putot-en-Bessin at 0630 hours. The Battalion managed to break into the village and surround several companies, effectively pushing the Winnipeg Rifles out of the village by 1300 hours and inflicting 256 casualties – of which 175 were taken prisoner. A counter-attack launched at 2030 hours by the Canadian Scottish, however, regained Putot-en-Bessin, and the II Battalion withdrew and dug-in south of the village. With neither side able to secure complete victory the lines on either side were becoming fixed and turning the battle into one of attrition to capture the surrounding villages. A company of Panther tanks arrived late on 8 June, and Meyer personally led a night attack toward the village of Rots, which they reached at midnight. After several hours of fighting, however, the 12th SS were forced to withdraw, leaving behind six tanks. The Canadians noted that, despite advancing with courage and determination, the young Germans seemed to lack tactical control and had a habit of attacking piecemeal and failed to exploit favorable opportunities. Despite the ferocity of the 12th SS counterattacks, the Division failed to fulfill its orders to throw the attacking allies back into the sea. British troops had moved up on either side of the positions now firmly held by the troops of the 3rd Canadian Infantry Division and had also established a firm line from which they could develop future operations. What followed were a series of local attacks by both sides. Neither was able to secure any strategic advantage, and the German defensive perimeter around Caen tightened. Casualties on both sides steadily mounted. The 12th SS headquarters, positioned in Venoix some 2 kilometers southwest of Caen, came under naval gunfire on 14 June, killing the commander, Fritz Witt, and several other senior officers. The High Command appointed Kurt Meyer as the new commander of the division. (some sources believe he was the youngest divisional commander on any side during the war). 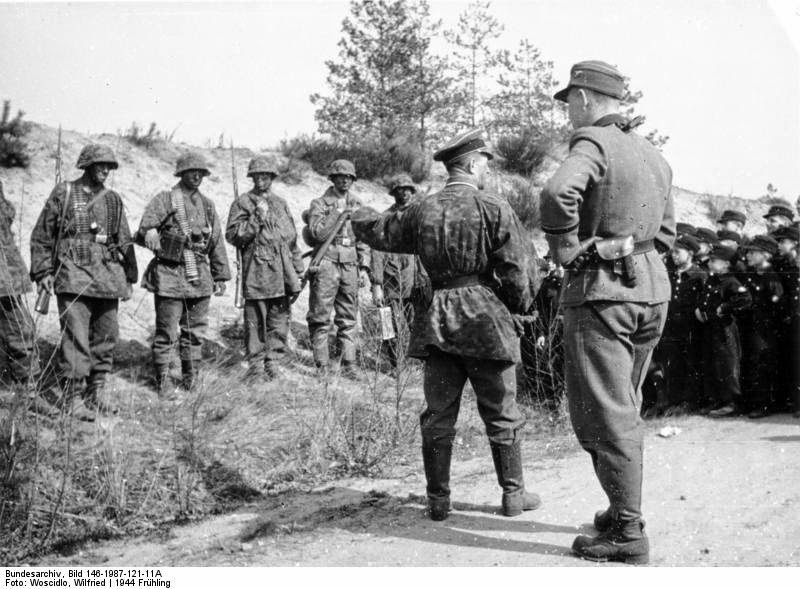 The 12th SS was now deployed in detachments north and west of Caen, and like the rest of the German Army, was suffering from shortages of ammunition, fuel and equipment. To the north of Caen, some of its Panzers supported unreliable units such as the 16th Luftwaffe Field Division and to the west, a flak battery and 15 tanks, together with the 1st Battalion, 26th SS Panzergrenadier Regiment, held the important Carpiquet airfield. The 3rd Canadian Division ceased major combat operations until July, with only one day of major operations, on 11 June, at Le Mesnil-Patry. This saw the 12th SS inflict major casualties to the Queen's Own Rifles of Canada and the 1st Hussars (6th Armoured Regiment) which lost 51 Sherman tanks during the attack. They fought like lions on both sides, so that the dead lay corpse by corpse. We searched every house, every courtyard to avoid ambush. And here is the confirmation of how ferocious last night's battle must have been. The Commandos lie dead in rows beside the dead SS. Grenades are scattered all over the road and in the porches of houses. Here we see a Commando and an SS man, literally dead in each others arms, having slaughtered each other. There, a German and a Canadian tank have engaged each other to destruction, and are still smoldering, and from each blackened turret hangs the charred corpse of a machine gunner. Over here are a group who ran towards a wall for shelter and were shot down before they got there. And then near the church, as the advance guard of C Company and the carriers turn the corner, there are three Germans. Only three. But one of them instantly draws his pistol and hits one of our men. A Bren gunner kills two of the three SS men, but the survivor gets away. Now we understand with what kind of fanatic we have to deal. The following two weeks until the end of the month, was a period of relative quiet, as both sides were exhausted. What did not stop was the constant Allied artillery, naval bombardment and air attacks. Major operations for both sides began again in July. Losses were suffered when the 12th SS successfully defended the Carpiquet airfield (which the Canadians called Operation Windsor) though the village of Carpiquet itself fell as only fifty men were available to defend it from an attack by an entire Canadian battalion. More attacks during Operation Charnwood fell upon the Division the following week. Vicious hand-to-hand fighting took place in various locations, notably at Buron with the Highland Light Infantry of Canada on 8 July where the Highland Light Infantry lost 262 men in a single day of combat with the 25th SS Panzergrenadier Regiment. The division was driven from its positions in nearby villages of Gruchy and Cussy as well, and the divisional command post in the Ardenne Abbey, which had been occupied since before D-Day, was also lost. For the next four days, the 12th SS held out against repeated attacks by the British I Corps. Finally 2,600 tons of bombs were dropped on Caen by the Royal Air Force. The bombing destroyed much of the city and caused further problems for the German supply line. Meyer, unwilling to retire, continued his bitter defense. Eventually though, the British were able to penetrate into the city, forcing the Germans to prepare to withdraw from Caen. On 8 July, after all hope of holding the city was lost, Meyer ignoring his orders ordered the evacuation of the city and the remnants of the Division withdrew to the south of Caen. From 0630 to 0800, again heavy machine-gun fire. Then Tommy attacks with great masses of infantry and many tanks. We fight as long as possible but we realize we are in a losing position. By the time the survivors try to pull back, we realize we are surrounded. The following day, the division was pulled out of the line and sent to Potigny, some 30 kilometers north of Falaise, for a rest and refit. The division was to have little respite though, and on 19 July were under attack by Anglo-Canadian forces Operation Goodwood. Following this the division was pulled out of the line and used to form the mobile reserve for I SS Panzer Corps. Goodwood was followed by Operation Cobra on 25 July, during which the German line finally broke, leading to the breakout of the Americans to the west. On 8 August the Canadian First Army launched Operation Totalize, a night attack without a preliminary artillery barrage. The point of the attack was again directed at the 12th SS. The attack started well and once they reached their objectives, the infantry started to clear out the defenders. The 12th SS Panzerjager Battalion held up the Canadians after an advance of five kilometres, with two member of the Battalion being awarded the Knight's Cross – SS-Oberscharführer Rudolf Roy and his gunner Fritz Eckstein who had knocked out eight tanks on 8 August. The next day they knocked out a further 13 tanks and within 5 days had knocked out a total of 26 tanks. Over the next two days, this action and continued series of counterattacks reduced the 12th SS to little more than a large Kampfgruppe. The Allies next tried to blast their way through with Operation Tractable, but the 12th SS had captured a copy of the plan on 13 August, and Meyer created a defensive line with what remained of his division. The Division, now reduced to 15 tanks, was called upon to defend Hill 159 northwest of Falaise between 14 and 16 August. Under almost continuous artillery and air attack, the 12th SS were forced to withdraw when the 2nd Canadian Division broke through on their western flank. With only one avenue of escape left open, what was left of the 12th SS were ordered to help hold open the northern side of the Falaise gap, so what was left of the German 7th Army could escape. When the withdrawal had been completed, Meyer ordered a Frenchman to guide the Division across the Dives River. After crossing the Dives Army Group B reported on 22 August that the 12th SS Panzer Division Hitlerjugend now consisted of only 10 tanks and no artillery. The battles in Normandy and lack of any reinforcements had nearly decimated the Division. During August the division played an important part in keeping the withdrawal routes open for many German units. The division itself did not suffer unduly. From 15 to 22 August its casualties amounted to 45 killed, 248 wounded and 655 missing ... In many publications it has been said that the (division) only had a few hundred men after the end of the Falaise battle on 22 August. This is completely wrong. According to the very thorough research in the records of casualties suffered by the division presented by Meyer, it is clear that the division lost about 8,000 officers and men, killed, wounded and missing ... (and) ... it is clear it had around 12,000 men on 22 August 1944. Even though most of its infantry were casualties, the division was far from destroyed. The units in the Division that were not fit for combat were ordered to pull back to Germany on 8 September, leaving behind a small Kampfgruppe attached to the 2nd SS Panzer Division Das Reich. It was formed around the 2nd Battalion, 26th SS Panzergrenadier Regiment with a mixed artillery battalion. The Division losses during the fighting in Normandy were severe, in the three months from June to September, 55 officers, 229 NCOs and 1,548 had been killed. A further 128 officers, 613 NCOs and 3,684 had been wounded with 58 officers, 182 NCOs and 2,012 reported missing. This was a combined total of 241 officers, 1,024 NCOs and 7,244 men. In all, the 12th SS Panzer Division Hitlerjugend suffered a total of 8,569 casualties out of a strength of 20,540 men; a casualty rate of 42%. It had also lost 94% of its armour and almost all of its artillery. On 14 January 1945, Dietrich's 6th SS Panzer Army was ordered east to Hungary where it was to take part in an offensive to recapture the Hungarian oilfields and open the way to Budapest, where 45,000 men of the IX SS Mountain Corps had been encircled. While the division was in transit, the IV SS Panzer Corps launched several ill-fated relief operations. The 12th SS, alongside the LSSAH as a part of I SS Panzer Corps arrived in Hungary in early February 1945, only a few days before the city fell. The division was thrown into action against the Gran Bridgehead, a strong position formed by the Soviets over the Danube near the town of Gran. The 12th SS and the LSSAH both fought well, and by the end of February the bridgehead had been destroyed. The division was next to take part in Operation Frühlingserwachen (Spring Awakening), the operation to retake the Hungarian oilfields. Adolf Hitler, desperate to keep the operation a secret, had ordered that no reconnaissance of the battlefield was allowed before the attack began. The attack got underway on 6 March 1945, in atrocious conditions. The spring thaw meant that the German attack was confined to a few narrow roads and, after initial successes, the offensive was aborted after a Soviet counterattack threatened to encircle the German forces. After the failure of Frühlingserwachen, Hitler lost faith in the Waffen-SS and ordered that the honorary cuffbands issued to the divisions involved in the attack be returned. Outraged at the order, Dietrich refused to pass it on to his men. In mid-March, a heavy Soviet attack near Stuhlweissenberg split Army Group Balck in half and resulted in a general withdrawal towards Vienna. The 12th SS was involved in many desperate rearguard actions, and on 13 April fell back from Vienna. Withdrawing through Odenburg and Hirtenberg, the division reached Linz, Austria near the American lines. On 8 May 1945, 10,000 survivors of the division surrendered to Major General Stanley Eric Reinhart, commander of the 65th Infantry Division, near Enns. The Ardennes Abbey in the Calvados department of Normandy, in France. Largely restored after it was used as an observation post for the German army in the Battle of Normandy. Approximately 27 Canadian prisoners of war were executed in or around the Abbey. Memorial to Canadian prisoners of war executed in the garden of the Ardenne Abbey, in the Calvados region of Normandy in France. War crimes were committed by the men of the Hitlerjugend division—they executed around 156 Canadian soldiers after capturing them. These murders and the consequent search for justice are well documented. Two British soldiers from the 50th (Northumbrian) Infantry Division were also murdered during the killing of Canadian prisoners. 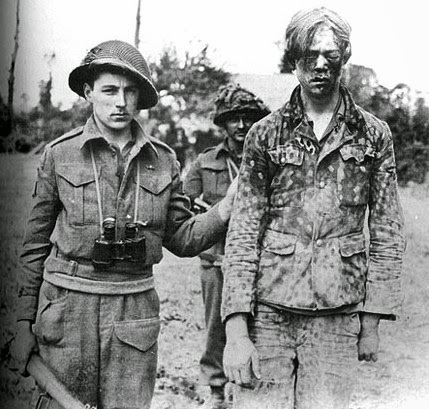 Between 7 and 8 June 1944, Canadian prisoners were executed by elements of Kurt Meyer's 25th SS Panzergrenadier Regiment at the Ardenne Abbey just to the west of Caen. As this was Meyer's command post, he, along with several subordinates, were charged with this crime after the war. Testimony at Meyer's war crimes trial, later deprecated, suggested that Meyer later made it clear he expected no prisoners to be taken during subsequent fighting. The evidence for this (called Exhibit T3, a handwritten testimony) was a set of secret orders given during training that was remembered by SS-Schütze F. Tobanisch who said that receipts of these orders had to be signed by all soldiers. No supporting testimony was provided and the witness was not available to the court. 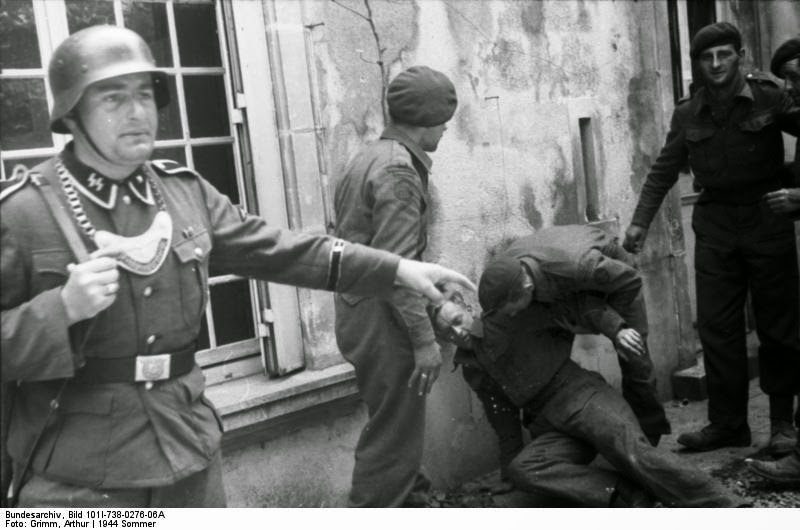 Also on 7 June the bodies of men, from the 21st Panzer Division and staff from 12th SS, were found shot in the head near Rots, which may have been a factor in the execution of the prisoners, according to Meyer. 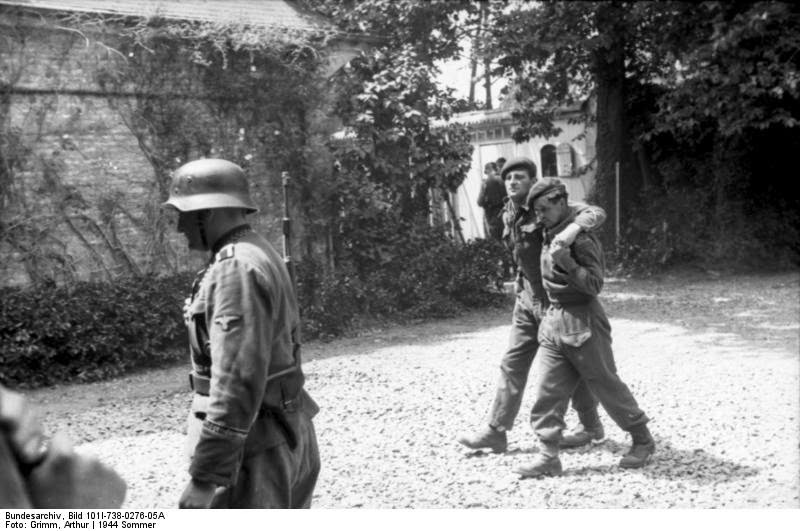 All the charges against the 12th SS are dated between 6–17 June. No official encouragement of those events has been documented, unlike the situation of the Canadian forces where Meyer claims that a "no prisoners" edict was in place as evidenced by documents captured from Canadian officers at the time. According to Meyer, the 12th SS Panzer Division returned three times the level of prisoners as other divisions. After the war, Meyer was tried and condemned to death by a Canadian military court for collusion in the shooting of Canadian and British prisoners. The main weight of the Prosecution's case rested on Jan Jesionek. 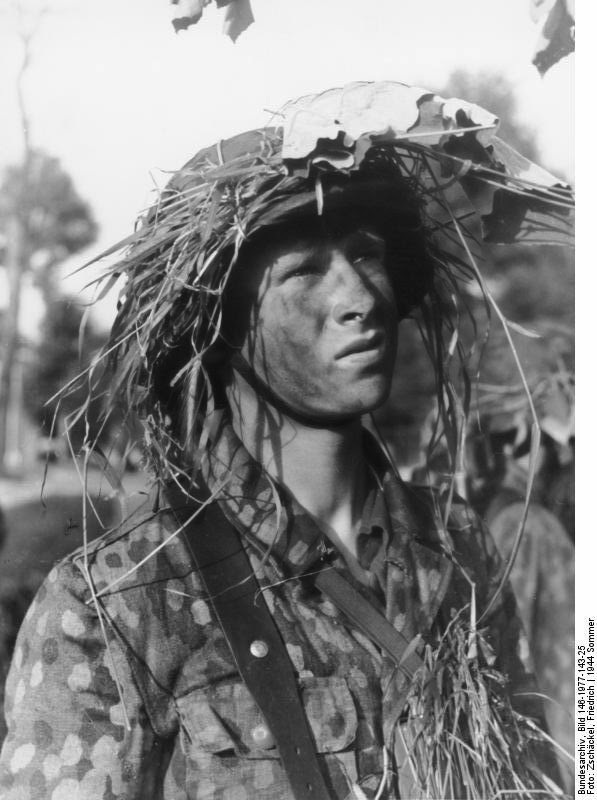 Jesionek was a Pole who is alleged to have been forcibly conscripted into the Waffen-SS from which he deserted. Jesionek's testimony was refuted by Meyer and as a result Meyer's sentence was commuted to life imprisonment by Canadian Major General Christopher Vokes, who considered all evidence against him circumstantial. Vokes recognized that in the heat of battle it was often difficult to decide who had killed an enemy and who had murdered a prisoner. There was no direct proof Meyer ordered the murder of Canadian prisoners but it was clear from physical evidence collected after the fighting that dozens of unarmed Canadians had been murdered after being interrogated by Meyer, who at the time, was the commander of 25th Panzer Grenadier Regiment. This can also be considered retaliation for what Canadian soldiers did to three captured German officers by tying them to their vehicles. Two were subsequently shot and killed while passing through the lines; the third one managed to crawl back to his lines where he subsequently died 3 days later. As the unit's commander, Meyer – while not guilty of the murders – was held fully responsible for the crimes committed by soldiers under his direct command. Victims' Families For The Death Penalty. NEO NAZI: FRAZIER GLENN MILLER JR.